The Bible comes to life at Sight & Sound Theatres just outside of Strasburg in Lancaster County, PA. These epic Biblical productions are musicals are like none you will find anywhere else. 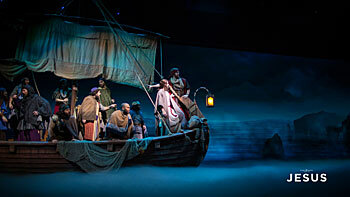 Story, song, and spectacular staging bring each Sight & Sound show to life. They take classic Biblical stories and characters like Noah, Daniel, Jonah, and Jesus and craft an elaborate musical production around each that tells the story and the underlining message of that portion of Scripture. Dozens of professional actors attired in elaborate costumes, meticulously-detailed sets towering up to 40 feet high, trained animals from camels to birds, and state-of-the-art special effects entertain and inspire up to 800,000 guests every year. Not only is there a large center stage at Sight & Sound, but productions involve the use of side stages on the left and right of the audience to make you feel like you’re in the middle of the action. 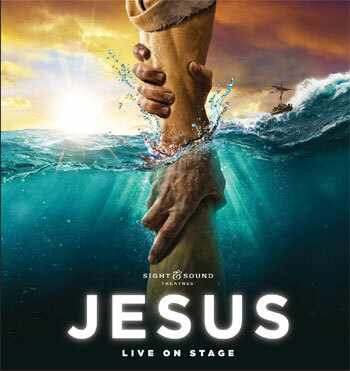 JESUS is the current show at Sight & Sound’s live theater in Lancaster, PA. It will return for an encore season, from March 9 – October 5, 2019. Also returning in 2019 is the holiday classic MIRACLE OF CHRISTMAS. Celebrate the season as the Christmas story is brought to life on a panoramic stage with massive sets, special effects and live animals. MIRACLE OF CHRISTMAS runs from November 2 – December 28, 2019. Sight & Sound also has a theater in Branson, MO. You can check their Branson show schedule here. Make Your Visit to Sight & Sound a Memorable Vacation! Make your visit to Sight & Sound Theatre even more rewarding by allowing extra time to enjoy some of the other unique attractions and experiences Lancaster County’s Amish Country has to offer. Lancaster has long been a popular destination for families, couples of all ages, and group travel. Peaceful Countryside – Slow down and experience the peaceful pace of the Amish Country. Learn about our Amish neighbors, and experience some of the unique Amish Attractions and points of interest here. Get away from the fast pace of life today and relax in our peaceful scenery and back roads, and take a drive or a bike ride through some of our more than 20 covered bridges. Fun Things To Do – Take in the diversity of the things to do in Lancaster County, including many fun attractions for families and for children. Lancaster is a popular destination because of the diversity of our live theaters, our unique heritage and museums, our original farmers markets, our many antiques shops, and a unusual variety of free things to do. Great Food – Many visitors return to Lancaster County for the delicious restaurants and the fresh farm produce. Plus, this area is well-known for its family-style dining and its fantastic smorgasbord dining. Quilts & Furniture – Popular souvenirs of Lancaster’s Amish Country include Amish-made quilts and hand-crafted Amish furniture and craft products. Make your visit to Sight & Sound Theatre a memorable vacation by enjoying all that Lancaster County has to offer! There is much to see and do near Sight and Sound and throughout Lancaster County. Enjoy!